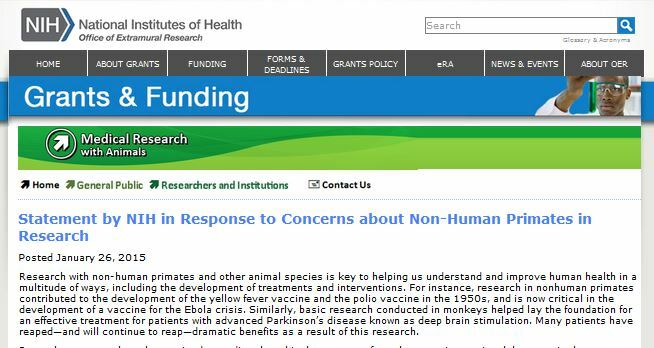 NIH’s response to the PETA campaign was thoughtful, thorough, and transparent. The response includes a positive assessment of the value of the research in terms of human health relevance and advances in scientific understanding. It addresses why the research in conducted in monkeys and why it is not possible to use alternative methods, or to conduct the work in humans. The response also includes a serious, fact-informed consideration of the animals’ welfare. Detailed responses from two of NIH’s Institutional Animal Care and Use Committees that conducted an extensive evaluation of the research address each element of the concerns raised by PETA and the scientists supporting them (including, Professors John Gluck, Psychology, University of New Mexico; Agustin Fuentes Anthropology, Notre Dame; and Barbara King, Anthropology, William and Mary College; Lawrence Hansen, Pathology, UC-San Diego). Taken together, NIH’s responses provide a strong demonstration of a high level of care and consideration of animal welfare, as well as the risk and benefit balances that are inherent in the conduct of research with both human and nonhuman animals. The response clearly vindicates Dr. Suomi and provides welcome public acknowledgement by the NIH of the importance of his work. As welcome as the NIH responses are, they are not, however, responses that will satisfy PETA’s absolutist goal of ending all use of nonhuman animals for any purpose, including animal research, but also food, companionship, entertainment, or other uses. As a result, it would seem that no response NIH could give to PETA would be satisfactory unless it was to end all animal research altogether. Or, in the case of a particular project or lab, the only response satisfactory to PETA or other absolutists would be to end that project, or close that lab. At some level then the question to ask may be about the cost: benefit of such responses. By contrast to the absolute viewpoint, aspects of ethical consideration of animal research that matter to the majority of the broad public and to the scientific community are evidenced by their instantiation in the laws of a democratic society and in regulatory and community standards, as well as in individuals’ own assessment. These include concern with significant public health challenges and appreciation for the critical role of basic scientific understanding as the foundation for a broad range of advances that benefit the public, other animals, and the environment. They also include acknowledgement of accomplishments and breakthroughs for human and nonhuman health that are accomplished via animal research. At the same time, they include selection of alternatives where possible, attention to animal’s care and welfare, continuing refinements of procedures in accord with evidence, risk and benefit justification, external oversight, and expert scientific evaluation. In the case of the current NIH campaign and other campaigns against specific animal research there is a well-known pattern. A group like PETA focuses on a research project—usually one involving animals such as cats, dogs, or primates that will capture broad public interest. The group then uses the highly responsive system of public institutions and government agencies to obtain information, call for investigation, and launch media campaigns to elicit public concern (and donations). The campaigns are typically based in some form of oversimplification and misrepresentation of the research, treatment of animals, availability of alternatives, or value of the science. In the face of public inquiry or media attention, public research institutions under attack typically offer a response focused on the scientific question, accomplishments, absence of non-animal alternatives, and on the animals’ welfare and oversight. The problem with that pattern is that it ignores the fact that PETA and others’ campaigns are, in many ways, a reflection of a conflict between fundamentally different philosophical viewpoints. These differences cannot be resolved simply by ensuring scientific advances, careful risk and benefit assessment and balance, or high standards for laboratory animal welfare. All the care, training, accreditation, and external oversight in the world will not address the concerns of individuals or groups who are absolutely opposed to the use of animals in research and who believe that no matter the benefit, use of animals in research cannot be justified. Nor will such approaches address those who believe — wrongly, in most cases — that there are existing alternatives to the use of animals in research. Furthermore, each additional layer of oversight and regulation introduced in an attempt to appease those who cannot be appeased may well add substantial administrative hurdles and costs to the scientific effort without achieving meaningful improvements for animal welfare. From that perspective, and in light of yet another PETA campaign that has resulted in a significant and extensive response from public agencies, the question becomes whether – and what – might be a better path forward. At present, the same path does not look like one that is productive to improving scientific research. Rather, the prediction would be that PETA and other groups will continue to use the transparency and responsiveness of public research institutions to lend steam to popular opinion campaigns that then target individual scientists, laboratories, and institutions. In turn, a great deal of time and energy will go into investigations, responses, and reports that are likely to yield little in terms of animal welfare, little public benefit, little progress to ending animal research, yet potentially high harm to science. At the very least these responses consume resources that would otherwise be devoted to scientific research or practical enforcement of regulations to protect animal welfare. As we welcome the NIH’s support for Dr. Suomi we must also ask ourselves a question: How many more cases like this will there be before the leaders of the scientific community take action to prevent the regulatory system from becoming primarily a tool of the animal rights propaganda machine? 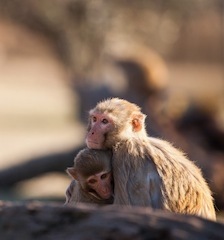 Posted on January 28, 2015 January 30, 2015 by EditorPosted in News, Outreach NewsTagged Agustin Fuentes, animal research, animal rights, Barbara King, development, infant, John Gluck, monkey, NICHD, NIH, NIMH, non-human primate, OLAW, peta, Stephen J. Suomi. The thing is: when we treat animals like this, we are not respecting life itself, the place we come from. You don’t have to be an ‘absolutist’ the denigrating terminology used in this blog) to understand that it typically ‘conservative’ (or even typically neocon) to believe that human beings are kind of superior to other species, like they are given a mandate to ‘manage the world’ including all animals – be that a so-called divine mandate or just a self-serving mandate. These things will not change unless we come to understand our responsibility as a human species from a different point of view, much more humble. There is no general mandate to cure all human diseases at the expense of other species, especially those who we suspect to be capable of suffering (we don’t need to be sure – if there are indications in this directions, then we are responsible for the suffering that we might cause). This is only human. Talking about scientific advantages in a sterile, objectifying way may sound great and ‘intellectual’ but it is not a solid argument. Having all the tools to do it as efficient as possible is not an argument. What I respect about the people who support PeTA is not necessarily every argument they use, but their attitude of caring, of feeling responsible for the life that made us, and having empathy more than a ‘clinical’ view on the world seen from a human-only point of view. It is unfortunate that some professional primatologists, many of them personal friends of mine, have joined PeTA in its campaign of lies and distortions and personal attacks. I trust that many of these colleagues are honest in their concerns. Please be careful about forming alliances with hate groups like PeTA and IPPL. I hope someone does the same thing these vermins are doing to these beautiful animals. Oh my, the world is full of cruel people.